My 4 year old has elves watching her for lunch. These look more like Keebler elves than Christmas elves to me, but she doesn’t know. They are sitting on a crust of their Rudi’s Whole Grain bread. 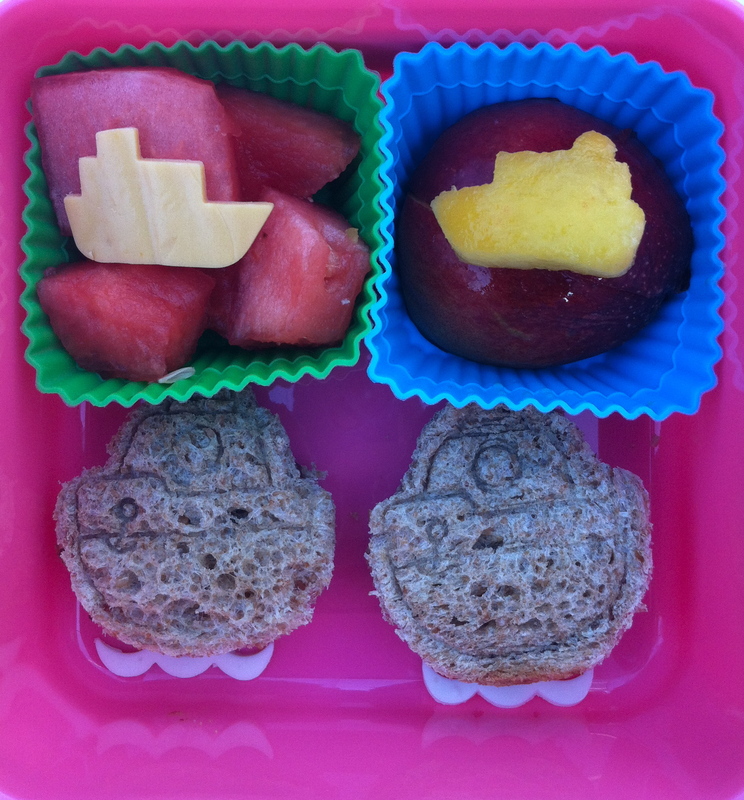 At the top left are small carrot Christmas tree sandwiches filled with Justin’s almond butter and in the top right compartment are watermelon trees cut with a tree shaped pastry plunger that I found in a set at Target and packed in her Easy Lunchboxes container. 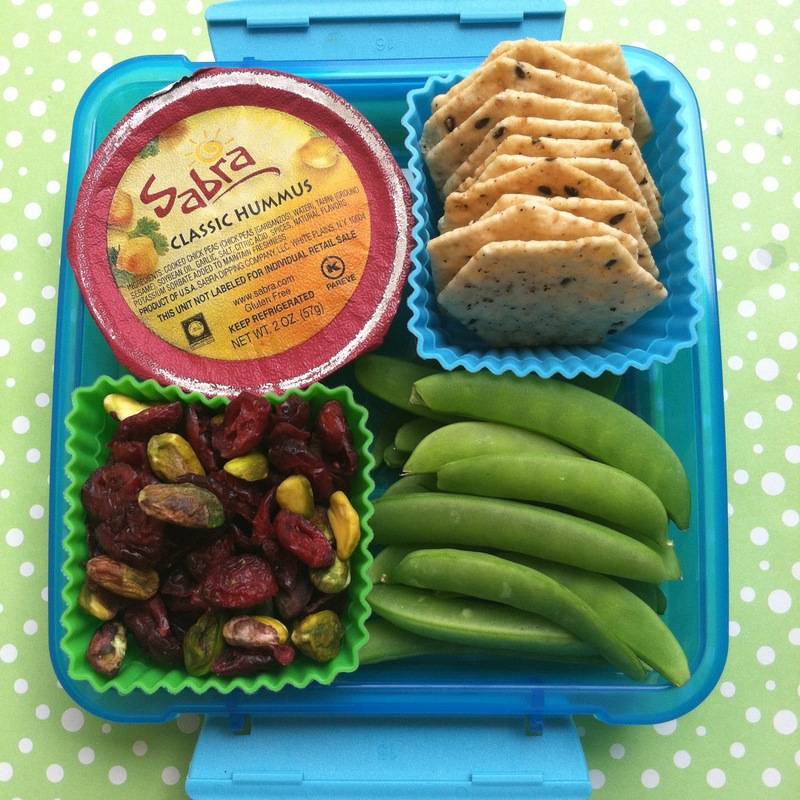 Miss G’s snack today was a container of Sabra hummus with dried sour cherries in the bottom, Newman’s Own pretzel sticks and cashews in the bottom. In the top tier are dried apricots stuffed with carrot trees and surrounded by raisins. On the right side are cantaloupe trees. Little Miss 2 year old is back to school today with a LunchBots Quad. From the top left are watermelon Christmas trees, raisins, cashews and carrot trees, cantaloupe holiday trees and 2 mini Santa sandwiches on Rudi’s Whole Grain bread. Live music thumping on the streets, gorgeous old architecture, cobblestone streets and lots of interesting people. What’s not to love about New Orleans? I spent a long weekend there for a blogging conference. I met some wonderful people, left with many pearls or wisdom and a large to do list and had a bunch of fun too. I thought that hurricane Isaac would be hitting my house in Florida when I got home. Luckily all we’ve seen is a bunch of rain and now the sun peeking out. Just hoping for my New Orleans friends that they escape the worst. Sometimes we need a little reminder of how lucky we are to have each day, and that our true needs are few. A rainbow lunch is what I decided on for Miss G’s school lunch today. A rainbow after the storm. We have a new LunchBots Quad stainless container for the new school year. At the top left are flower sandwiches on Rudi’s Whole Grain bread, top right are mini carrots underneath sugar snap peas and yellow bell pepper strips. At the bottom right underneath are lots of pineapple pieces, and papaya and strawberry flowers on top. And at the bottom left are picks of blueberries and blackberries. For her snack today she had Sabra hummus with Sesmark brand Ancient Grain crackers made of amaranth, millet, sorghum and quinoa. 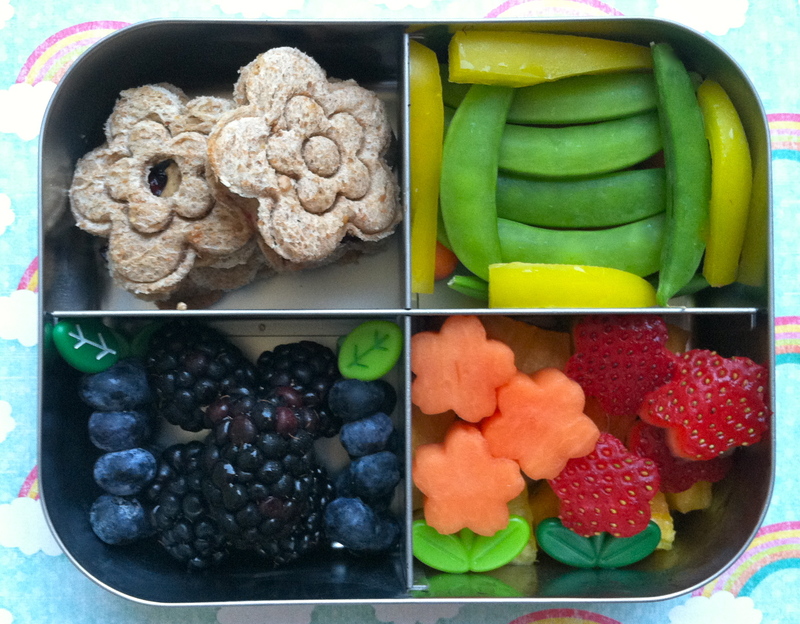 She also has sugar snap peas and pistachios mixed with dried cranberries packed in her sistema brand bento. Not shown is her Kleen Kanteen water bottle. And I sent my husband off to work with some leftovers (not shown) and a mixed green salad with sugar snap peas and mini carrots. 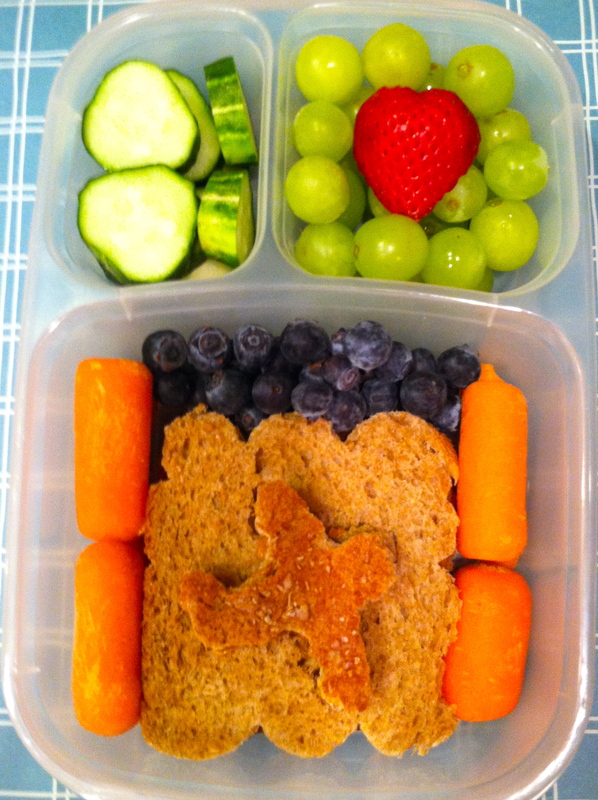 At the top left are organic blueberries and at top right are organic plums and nectarines packed in his Easy LunchBox container. I’m outta here! It was a last minute decision, but I think it will prove to be a great one. I was invited last minute to the Niche Mommy conference in New Orleans this week. I’ve never been to New Orleans so I’m really looking forward to checking the French Quarter out. My high school symbol was the fleur de lis (goes with my French loving theme well) so I decided to do a Fleur De Lis salad for my husband. After all, he has to take care of the kids while I learn all kinds of new blogging techniques, social media tricks, hopefully improve my photographic skills and maybe have some good old fashioned girl fun while I’m away. The salad is baby spinach and lettuce from the local organic farm. 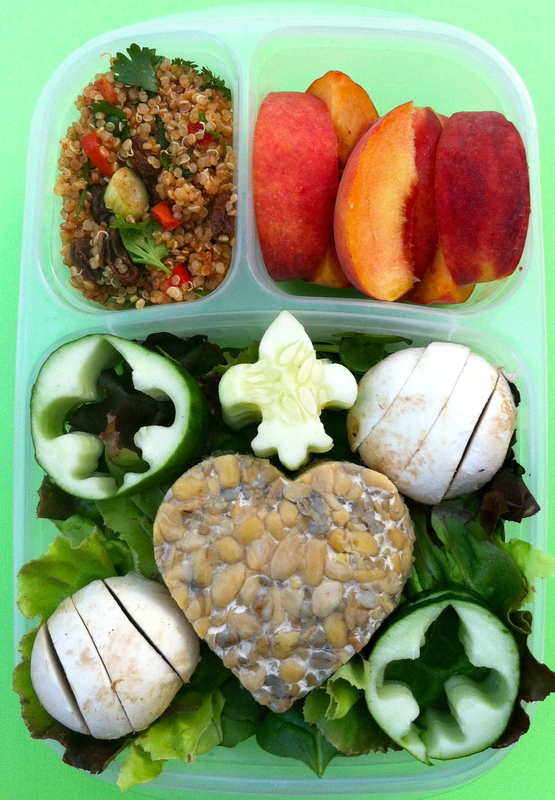 On top is a heart of tempeh (fermented soybeans) which reminds me of a heavy barley. Sliced mushrooms and fleur de lis cucumbers are also on the salad. At the top left is quinoa salad with scallions, italian parsley, red and green peppers. 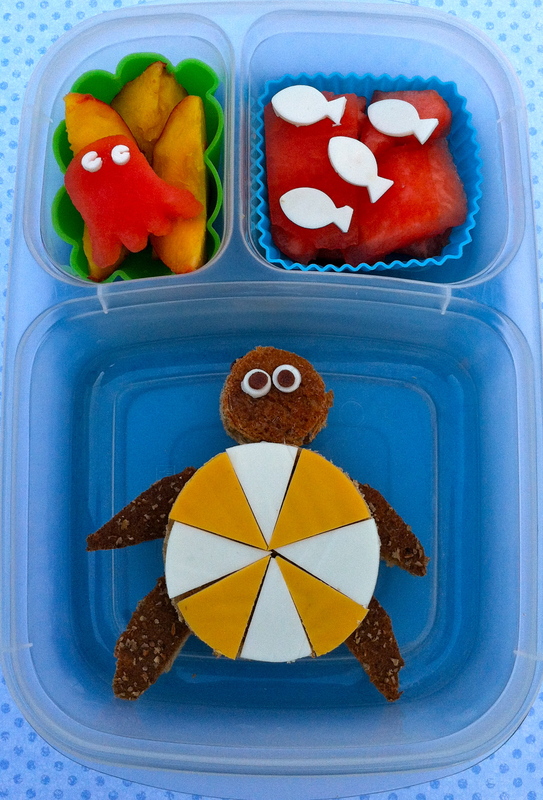 And at the top right are peach sections packed in his Easy LunchBox container. Not shown is his ginger salad dressing. I packed myself an Easy LunchBox for the trip today. From the top left are dried mango pieces, pretzels and crackers for dipping. In the small blue silicone cup is Eggless Salad by one of my favorite vegan chefs, Lindsay Nixon, better known as the Happy Herbivore. Lindsay’s recipes are simple enough to get dinner on the table in 30 minutes, and yummy enough that they will become weekly staples in your house. If you’re looking for meatless and/or dairy free recipes, I highly recommend purchasing her cookbooks. I have 2 and a third pre-ordered from Amazon I like them so much! 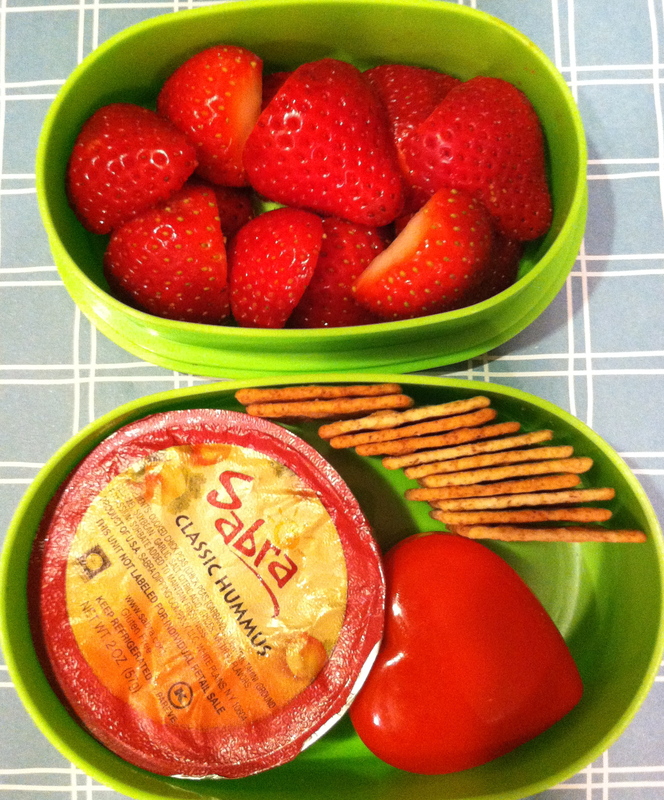 Organic strawberry hearts mini almond butter sammies and Sabra hummus make up the rest of my lunch. Hoping everyone has a fabulous weekend! We are so fortunate to live in Florida where we have exposure to so much marine life and education. My kids get great learning experiences whether it’s at the beach or at the local aquarium. We also get to visit the birds and mammals who have been injured from fishing lines, plastic bags and other various injuries and watch them rehabilitate here and be released. During turtle nesting season here (now, spring through fall) we see the roped off sea turtle nests and have even found sea turtle eggs after they’ve hatched. At our local aquarium, Mote Marine Laboratory, we get to visit the hatchlings when they are there before their release and the older turtles who live there. They have loggerhead and green turtles which are both native to the area. Mote does a lot of great research and education in our area and in other areas of the state. We are lucky! Miss G has my cartoonish version of a sea turtle. They’re much cuter in person! She has a Justin’s Almond Butter and jam sandwich on Rudi’s Whole Grain bread. The fun pie pieces on its back and its eyes are made from dairy free cheese. His legs are made from the crusts. At top left are nectarine slices and a watermelon octopus. 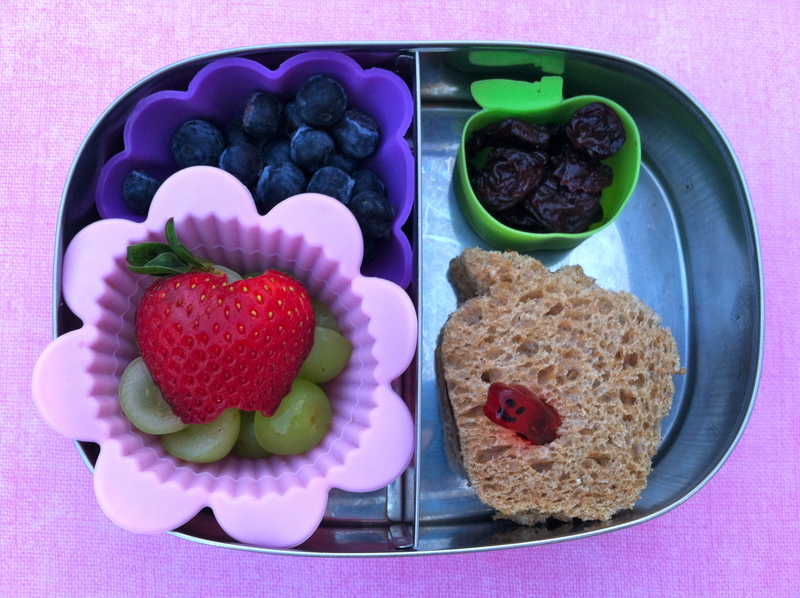 At the top right are watermelon chunks with soy cheese fish on top packed in her Easy Lunch Box. Miss A has mini boats for her lunch below. At the top left are watermelon chunks and a soy cheese boat on top. At the top right are nectarine slices and a nectarine boat on top. 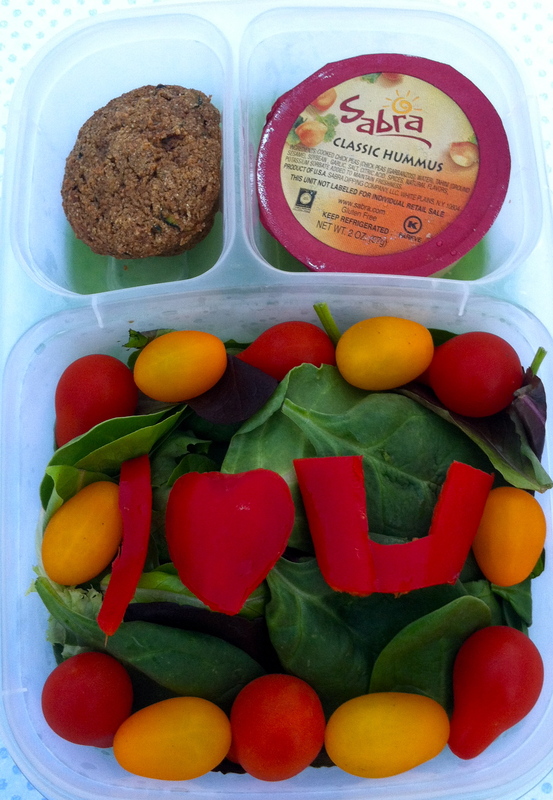 And to go with his rice, tofu & veggie bowl lunch, I packed my husband an Easy Lunch Box of a salad of mixed greens and spinach leaves, locally grown grape tomatoes and a red sweet pepper “I heart you”. At the top left is a homemade zucchini mini muffin. 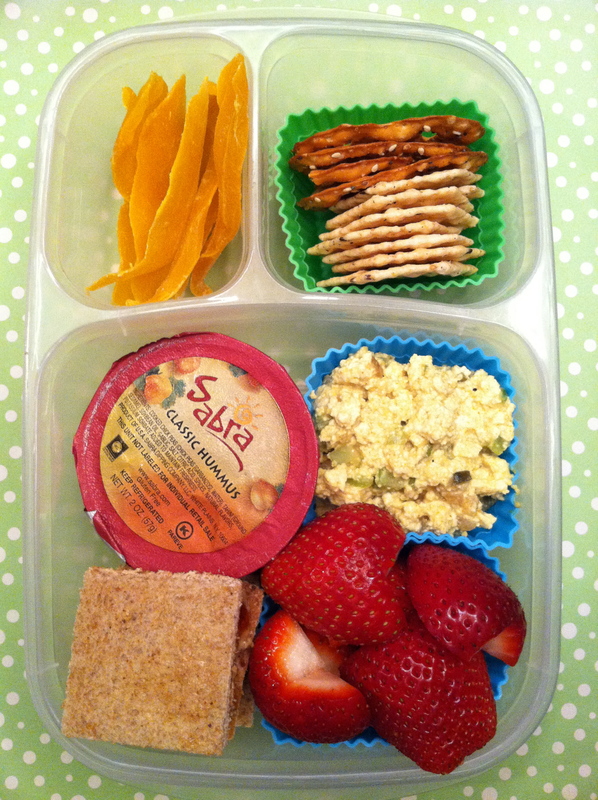 At the top right is a single serve container of Sabra hummus and not shown are whole grain crackers for dipping. This week is the letter V at preschool. Miss G gets an A E I O U lunch today. 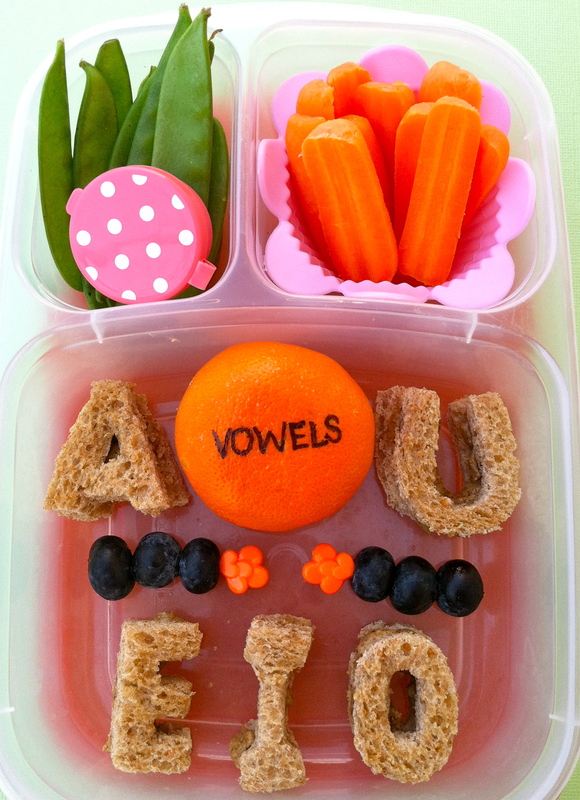 We’re working on some bigger concepts now so this is her intro to vowels. I don’t expect her to get it right away, but she’s reading enough now that she can have an introduction to them. She did tell me on the way to school that I should have known she wanted a van for lunch. Can’t win them all. I guess tomorrow we’ll do a van unless the teacher comes up with something more interesting. Her AEIOUs are made with Rudi’s brand whole grain bread and almond butter in them. The small orange picks have blueberries on them and I wrote vowels on the mandarin orange in marker. At the top left are snow peas and top right are sliced mini carrots. In the pink polka dot container is honey mustard which she discovered she likes recently. Her lunch is packed in an Easy Lunch Box. Little Miss A is still doing her 2 year old finicky eating. 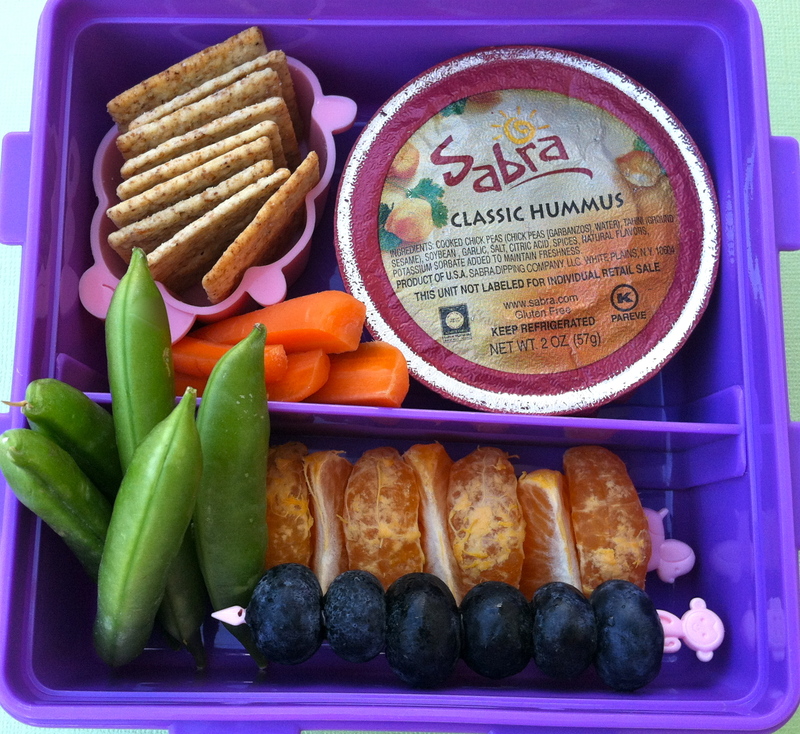 Today she has a Sabra plain hummus cup with whole grain crackers and quartered mini carrots. 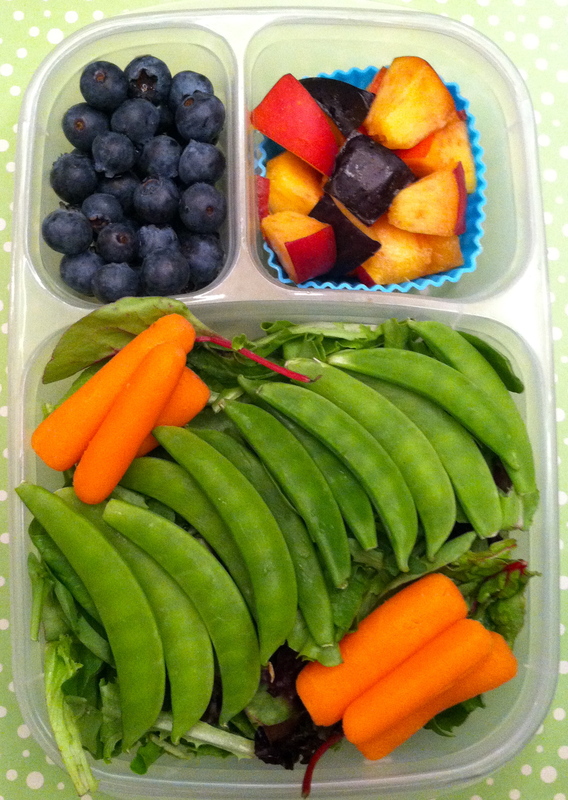 Below that are sugar snap peas, a pick of mandarin orange wedges and blueberries. Both girls have ice waters with their lunch. And last but not least is my husband’s sides. He’s having Amy’s brand frozen vegetable lasagna for the entree. 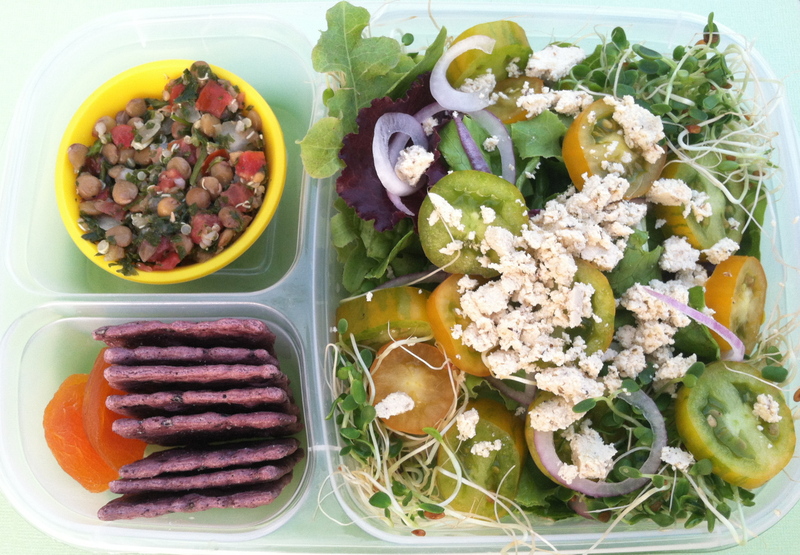 To go with is is a mixed green salad with red onion slices, green and yellow plum tomatoes from the local market, sweet clover sprouts and mediterranean flavored vegan (soy) feta cheese on top. 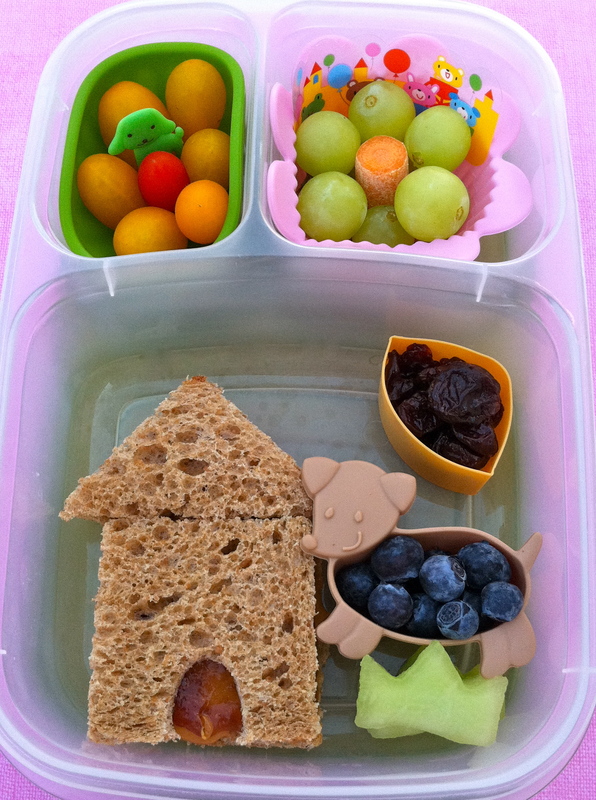 At top left is a cup of lentil & quinoa tabbouleh and at the bottom left are purple rice crackers for the tabbouleh and 2 dried apricots packed in his Easy Lunch Box.